Attendees at the opening of the 2012 International Consumer Electronics Show may well have been wondering if a lightning storm had struck one of the fountains along the Las Vegas strip overnight, as a high-tech version of "The Change-Up" played out in the two keynote addresses that started and finished the day's events. In the morning there was Dr. Paul Jacobs, Chairman and CEO of Qualcomm, inviting Liu Jun - Senior VP at Lenovo, on stage to demonstrate the use of his company's Snapdragon mobile processor in a new Android-powered smart-TV to be sold in China. 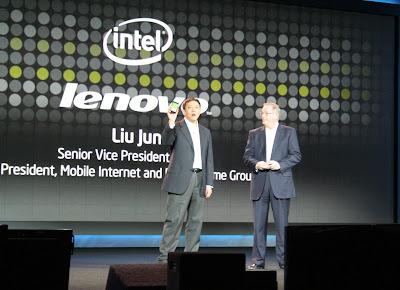 Then, at the end of the day, Paul Otellini - President and CEO of Intel (which had recently abandoned its involvement in Google-TV), also invited Liu Jun on stage. This time Mr. Jun announced the development of a Medfield Atom processor based Android-powered smartphone, also to be sold by Lenovo in China. The role-reversal played out further, as in the morning Jacobs had talked about the ARM-core based Snapdragon powering Microsoft Windows phones and other future devices, while Intel followed the rollout of the K800 by calling Motorola Mobility Chairman and CEO Sanjay Jha on stage to announce a new strategic alliance between his company (which Google intends to acquire) and Intel, for future development of mobile devices based on Atom processors. 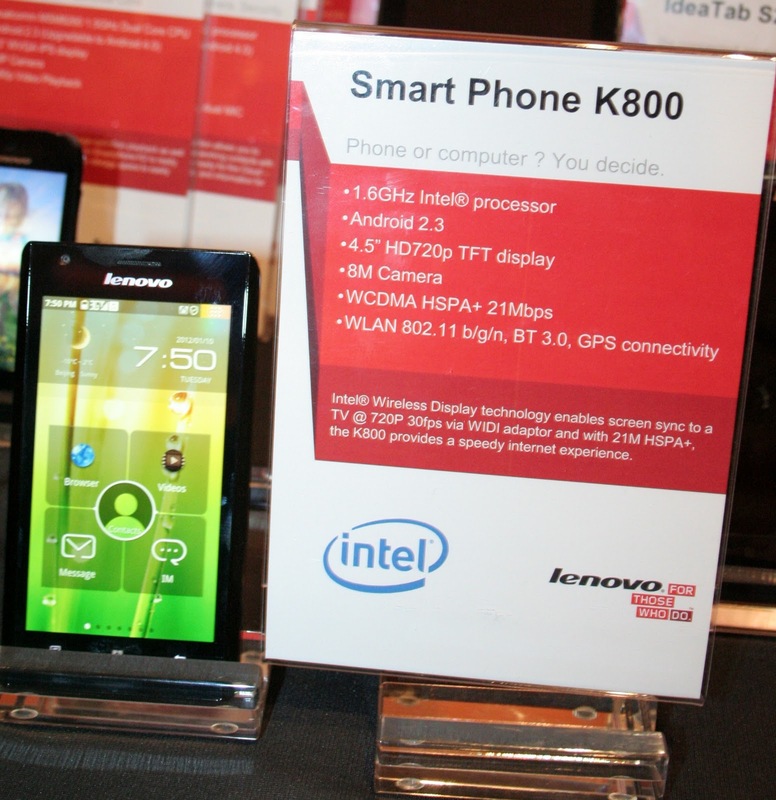 The Atom-Medfield K800 smartphone runs the Google Gingerbread 2.3 version of Android, while the Snapdragon smart-TV has Lenovo's adaptation of the Ice Cream Sandwich version of Android 4.0. 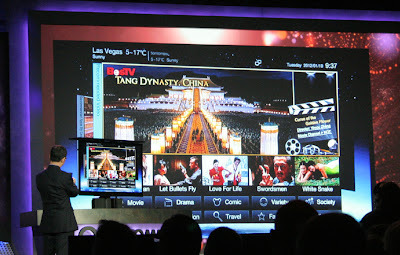 Both devices were on display by Lenovo in the evening "Show Stoppers" event at CES. 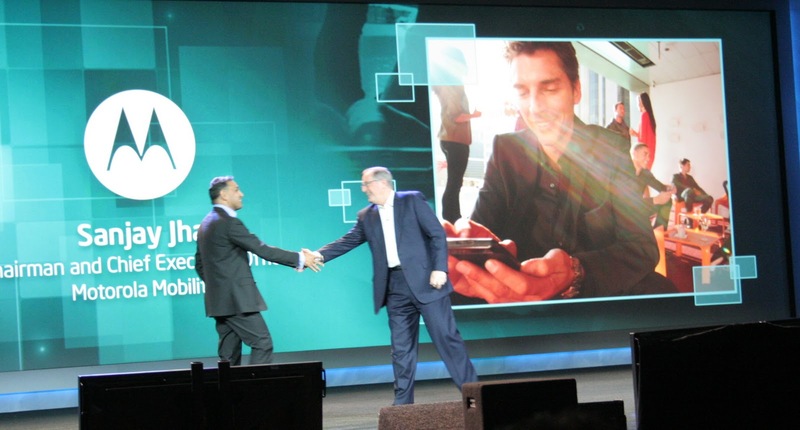 So much for the end of Android fragmentation! Since Google did not design Ice Cream Sandwich for use in TVs, the Lenovo devices will not be able to access the Android Market. 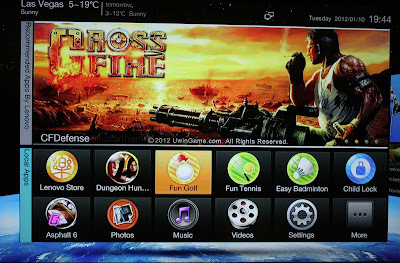 To address that issue, Lenovo has developed their own app store from which their customers can download games and other Android apps. 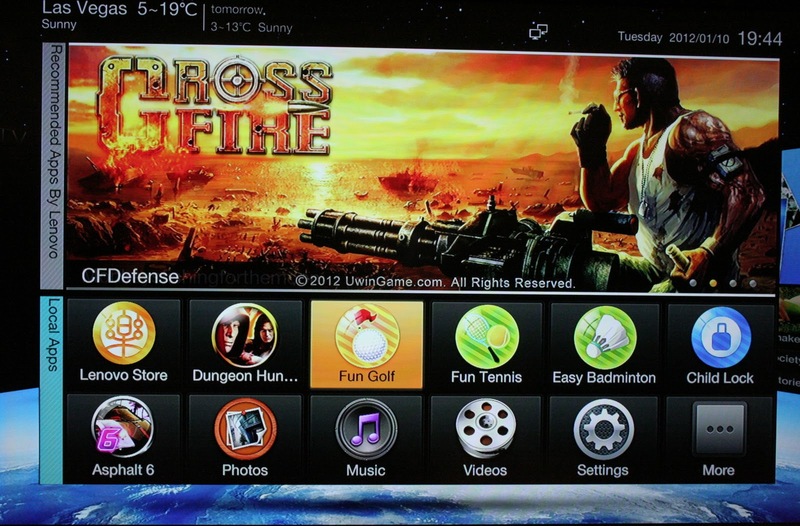 The TV remote control also operates like a WII controller, with built-in motion sensors.